Patong Phi Phi tours are highly popular for those who are staying in one of Thailand's liveliest resort beaches, who want to reach out and explore one of the region's most dramatic coral islands. Patong Phi Phi also refers to the 40 minutes bus transfer and the one hour 30 minute ferry route between the 2 islands. Patong and Phi Phi couldn't contrast more sharply and yet there are more similarities than you might think. Patong Beach owes its popularity to it's wonderful west facing location. This lets the golden sunsets pour in every evening. The Patong Highlands surround the 3.2km sandy beach. This ensures an experience of nature wherever you look even though Patong Beach, is essentially a resort town. However this is 'The' Town resort to come and experience an outrageously vibrant nightlife scene with more cafes, restaurants, bars, clubs, discos, shows than you can imagine. Conversely Phi Phi is the epitome of nature. It can send a shiver down your spine. The shocking picture-perfect beauty of Tonsai Bay, Maya Bay, Loh Samah make it a visual overload. It's a place of natural splendour where you feel yourself grabbing a camera wherever you look. However, contrasting with this background, the main village of Phi Phi Don is a busy mini low rise Asian Bazaar version of Patong all set under a canopy of coconut trees. To add to the charm, Phi Phi is so small there are no cars. Also only 10% of the island is flat, the rest is mountain. The Patong Phi Phi ferry route takes you from your Patong Beach hotel or resort over the Patong Highlands pass, down through Kathu and Phuket town to Rasada Pier. From here you join any number of ferries out to Phi Phi Island which lies just 48km away and can be seen on the horizon. The Phuket Phi Phi ferry timetable and booking instructions make the process straight forward. With a few clicks you have arranged your pick up from the hotel reception all the way through to Phi Phi Don Pier. If you are staying at one of the luxury resort in the north of Phi Phi Don, like the Zeavola Phi Phi Resort, Holiday Inn Phi Phi Island and Phi Phi Island Village Resort And Spa, the resorts will send their launch to collect you. The onward trip takes just 5 minutes by speedboat, but a more sedate 20 minutes by the traditional longtail boat. If you are staying at one of Patong's finest hotels like the Holiday Inn Resort Phuket, Phuket Graceland Resort And Spa, Duangjitt Resort and Millennium Resort Patong Phuket, you might want to take a private speedboat over. This system is similar to the ferry in that you need to take a taxi or bus from Patong Beach over to the marinas on the east coast of Phuket. However this gives you the advantage of flexibility. You don’t need to get up early to catch the 08.30 cruise boats when you can take an any-day-time speedboat at your leisure. Patong Phi Phi speedboats can be booked with ease.. 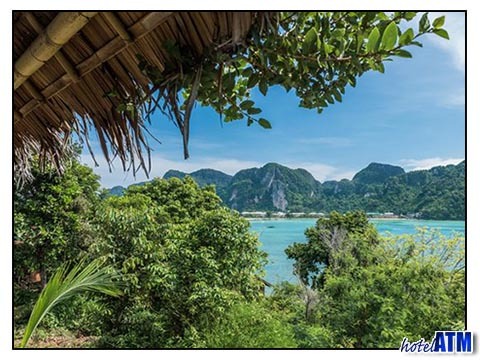 The choice of Patong Phi Phi island tour comes down to 3 variations. The Phi Phi Island & Maya Bay by Sea Angel cruise ship has a 7.30 start from your Patong hotel or resort and takes you out past Koh Maiton and Koh Doc Nai and enjoys a startling views of the Phang Nga Islands. This is an all inclusive sight seeing tour with plenty of time to snorkel from the beach. The Patong Phi Phi speedboat tour combines the rush of a fast drive out through the islands with the ability to spends more time on the beaches, snorkeling and getting some excellent time on Maya Bay. This Phuket Phi Phi Tour by fast Speedboat is highly recommended for those who have the adventurous spirit. Patong Phi Phi diving tours take you out to Phuket Shark Point or out to Phi Phi Ley. The most popular Patong Phi Phi diving tour is the 3 Dives to Shark Point, King Cruiser and Koh Doc Mai where you combine Phuket Shark Point rock outcrop famous for it's leopard sharks, the King Cruiser wreck in 22m of water and a wall dive on Koh Doc Mai. The dive pier is at Chalong Bay and you have to cross the Patong Highlands over the Kata Pass.